Combine ingredients. 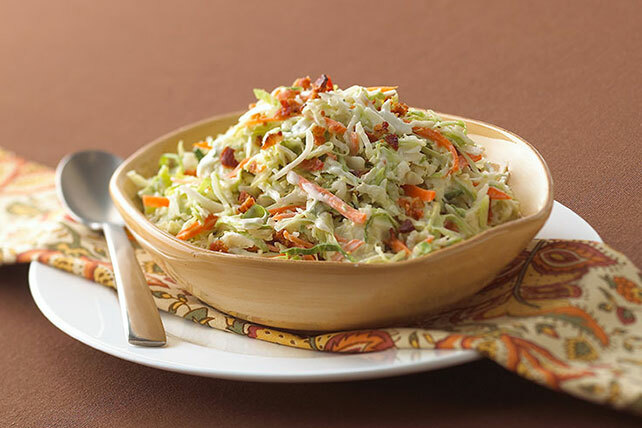 That's all it takes to make our crunchy coleslaw with bacon. Three ingredients makes Ranch-Style Coleslaw with Bacon simple to make. Prepare as directed, using KRAFT Asian Toasted Sesame Dressing and substituting 1/4 cup chopped PLANTERS COCKTAIL Peanuts for the bacon. Prepare as directed, using KRAFT Classic CATALINA Dressing and substituting 1 small chopped apple for the bacon. Prepare as directed, using KRAFT Tuscan House Italian Dressing and substituting 1 small red pepper, cut into short thin strips, for the bacon.